For Christmas, I was given tickets to go to a most magical place, The Midlands. I went to Lichfield, birthplace of Samuel Johnson. I have wanted to go there for years, since I discovered that his birthplace museum has more artefacts belonging to Johnson then the museum in Gough Square. I am a sucker for a cathedral city. I spent a wonderful day in St Albans, and a few wonderful ones in Canterbury, so I was looking forward to it. I had two days there and I feel I imbibed most of what the city has to offer. First of all, it’s like Disneyland for Johnsonians. As soon as I got off the train, I crossed the road and found myself at the site of the old Grammar School, where Johnson, Garrick and Addison took their early lessons. Wandering around is magical. You turn a corner and there was Johnson’s Dame school, where he once walked home alone and seeing the mistress of the school following him to check he was safe, turned round and attacked her out of pride. You walk all over and find places that resonate; the Garrick home, the house of Gilbert Walmisley where Johnson first practiced his debating skills and the Stowe Pool where his father taught him to swim. Lichfield also has some very interesting non-eighteenth century history. The cathedral close had been fortified in the middle ages, meaning that it was the recipient of three tough sieges during the English Civil War. In the first siege, the parliamentarian general was killed by a dumb sharpshooter from the tower which such a shot seems impossible. (Chatting with some local history-buffs, it may be that a different tower was meant). I wonder how much Johnson’s own royalism (and occasional Jacobism) are influenced by the town’s Civil War Experience, where the cathedral was near destroyed by the parliament men and was still being rebuilt when he was born. I also wonder about how his protestantism was affected by the fact that the market square was the scene of several people being burnt at the stake in the reign of Mary I, including the last person to be killed in that way. 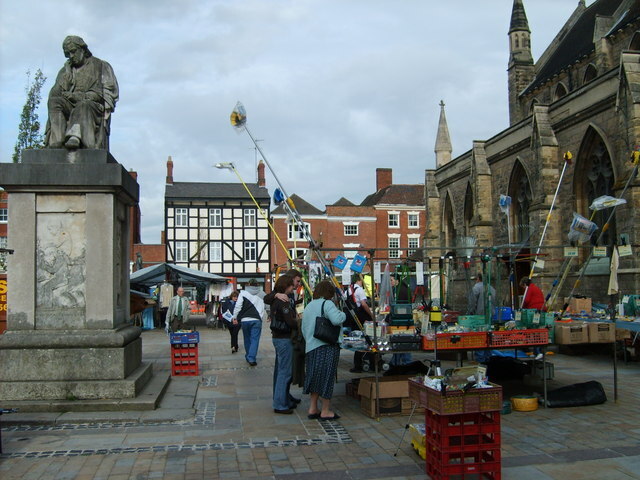 The market square is a brilliant spot for Johnson-philes. On one side is his parish church, where he was christened and attended until some of the roof fell on the family pew. On the other side stands his birthplace. The square itself now has a lovely brooding statue of Johnson on a chair, there is a sprightly one of Boswell as well but he is hidden behind stalls on market days. Just up from the market place is The George. That is where I stayed. It’s a coaching house, the setting for Farquhar’s The Beaux Stratagem and where he stayed when he was a recruiting officer in the town. Just up from that is The Swan, where Hester Thrale stayed during her visit (now an Ask Pizza place) and The King’s Head, where the First Staffordshire Regiment was founded. But what about Johnson’s Birthplace itself? I was delighted that the front room was still a bookshop, as it had been in Michael and Samuel’s day. I bought a book there and it felt utterly right. There was something magical about going down into the kitchen where Johnson as a boy read Hamlet and was so scared by the ghost that he ran up the stairs and outside to see other living people. Some of the objects also gave me the shivers. There was Johnson’s wedding ring and a saucer he used everyday which he nicknamed ‘Tetty’. There was the very writing slope upon which he rushed out Rambler essays. There were his canes and boot buckles. The fact that each of these items were part of his daily life gave me goosebumps and I stood in awe of the writing slope like someone in a reliquary. The place was a little let down by old museum presentation techniques, the stiff mannequin with audio recording method of dramatising moments of Samuel’s life seemed a bit unnecessary. It also wasn’t helped by some aloof staff, who didn’t engage much with a fan, and the fact that the only other visitors were two bored Lichfield teenagers on their Easter break, running up and down the stairs. But there were enough special moments in there to make it a thrilling experience for me. Back across the marketplace, his parish church housed the Lichfield City Museum. This was another creaky place, empty and a little mothworn. That said, it did give a very useful overview of the city. The three spires of the Cathedral dominate the centre. I spent a lot of time reading (Christopher Hibbert’s ‘The Personal History of Samuel Johnson’) at the Minster Pool, where the sun shone and the spires reflected hazily in the water. I also went inside. The most fascinating thing there were the remnants of Anglo-Saxon worship, including an angel with a viking axe scar through it and St Chad’s Gospel, a beautiful 8th century book still used in worship. Later on, I took a walk down the Stowe Pools to St Chad’s well, an old pilgrimage site. Finally, I went to another house in the Cathedral Close, the house of Erasmus Darwin. I did not know much about him, except that he and Johnson didn’t hit it off. I’m currently reading his biography and can see why; Darwin was a deist, revolutionary who believed morals should be taught without religion. But Darwin was a really interesting man, and completely different to dear old Sammy. He was an optimist, a thinker who allowed his mind to roam and experiment and a generally affable and interesting person. He also liked to invent and one room had working versions and models of some of his inventions. He created the system of steering that modern cars use; drew designs for a steam carriage, made a vertical windmill, lifts for locks, created a model of a bird that used two of the (then undiscovered) secrets of how birds fly. He also made a machine that could make simultaneous copies of documents and a sort of ‘robot head’ that could say ‘ma-ma and da-da’. Reading his biography, it seems like he could have advanced science fifty years if he had been brave enough to publish. He was also a member of the Lunar Society; a group that included Boulton, Watt, Wedgewood, Mariah Edgeworth’s father and a man called Day who did a very dodgy experiment when he tried to train his own perfect wife. These people were at the hub of the industrial revolution, discussing everything from steam power to the abolition of the slave trade. Finally, Darwin was a poet, the most popular just before the romantics came along. His poetry inspired them and in one of his books he described a belief of his that animals had changed, evolved and adapted over time to suit their environments - a belief taken up and expanded upon by his grandson, Charles. Now, it may seem I have lost Johnson behind….he is still my favourite but Erasmus Darwin is a much unacknowledged and fascinating individual. His museum was staffed by proper Erasmus-nuts and they made it a great place to be. In summary, I would utterly recommend a day trip to Lichfield. Make it a long day, make sure you visit Johnson and Erasmus and say hi for me.